It was kismet that I would pick this book up next. I’ve been encouraging my older child to start picking up adult books instead of the half book/half comics that they aim at children these days so he could start learning more advanced writing through osmosis, and I mentioned to him that I was reading things like Agatha Christie by his age or a little older (to be honest, I think I was still on the juvie science fiction for another year or so). And it was just about Hallowe’en. So when I came across this book on my hallway to-read shelves, I knew it was the one for me right now. When I was younger–in high school, probably–I read a lot of Agatha Christie because the libraries–the school library and the community library–had a bunch of them. So I read a bunch. Apparently, in the annals of this blog, I’ve only read one book, Elephants Can Remember, just over ten years ago. I don’t recall seeing a bunch of Agatha Christie at book sales, so I have to wonder if we the English-speaking peoples of the world, have aged out of her books faster than she stopped writing them. This volume, like Elephants Can Remember, is a later book of Christie’s, written in 1969. So the characters are modern, or at least mod, as some of them sport sideburns and those awfully colored pants that marked the era. 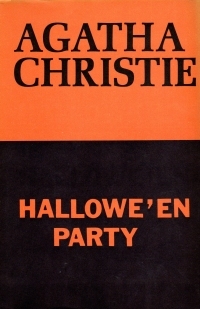 Mrs. Oliver, the authoress who joined Poirot in these later books, attends a Hallowe’en party where a thirteen-year-old girl is murdered after claiming to have seen a murder. Mrs. Oliver brings Poirot in to investigate, and he finds that most of the town people think that the young lady was a liar. But someone believed her. The plot involves a forged will, an au pair who might have forged the will and disappeared, illicit trysts, and a couple of prior deaths that Poirot uncovers as he goes through the list of people who were at the preparations for the party and heard the young lady make her boast. The twist in the book was pretty obvious, or perhaps it’s just a turn in it, and the resolution rather ended abruptly with an ending that was not hinted at effectively through the book. I didn’t reach it and say, “Oh, yeah, I should have seen that.” So it fails at that, although in retrospect, looking back oh those many decades, I don’t know if any of them actually had the kinds of endings where I thought, Of course! I should have seen it! They either had twists I saw coming a mile away or endings like this one, where you think the detective had some inside information or that the convolutions in the plot revealed only convolutions in the plotting. At any rate, it was a quick enough read. As I mentioned, I don’t see a lot of Agatha Christie books at the book sales, but then again, I’m generally not going over the fiction section at the Friends of the Springfield-Greene County Library book sale anyway. So unless I see them in a garage sale or the Friends of the Christian County Library, I won’t see them if they are there. I’d add some to my to-read shelves if I found them, but I don’t. So make of that convoluted endorsement what you will.